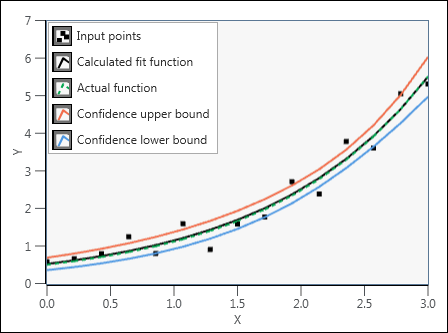 Calculates the confidence interval of the best exponential fit for an input data set. If the noise of y is Gaussian-distributed, you must fit the observations with the Curve Fitting (Exponential) node using the least square method to obtain amplitude and damping. Dependent values. y must contain at least three points. Damping of the fitted model. Confidence radius of the damping of the fitted model.